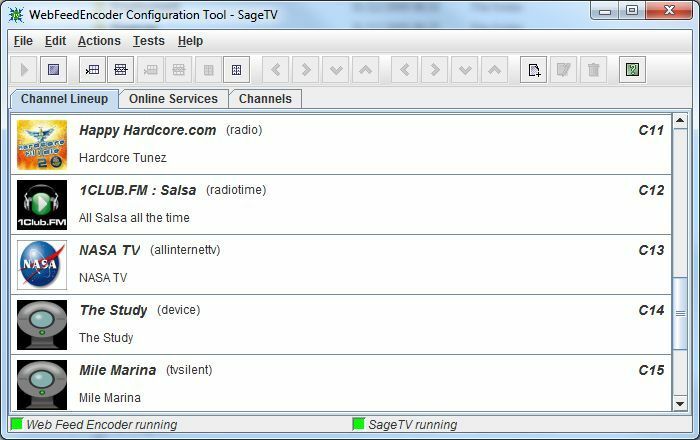 The webfeedencoder is a means to get web based streaming TV and radio and device output available in SageTV and its extenders as if they were regular channels. As far as SageTV is concerned the webfeedencoder behaves like another TV tuner. The excellent VLC media player software is used to tune to the internet TV or radio station, add video to the radio, or audio to video where its missing, and dump to an MPEG2 file for SageTV. 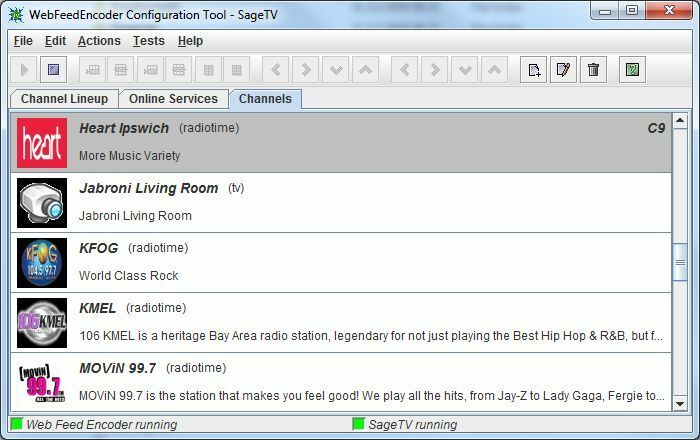 The means of tuning and detuning is completely configurable so any source of video or audio could be fed to SageTV via the webfeedencoder. 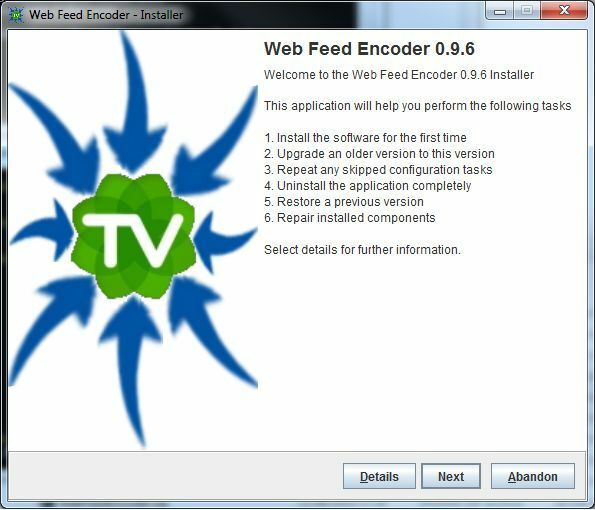 The webfeedencoder also includes an EPG grabber to harvest schedules from the web pages and other sources and update SageTVs program guide without need for an XMLTV importer. Feeds can also be added to online services menu in SageTV. Find and configure new channels and online services. 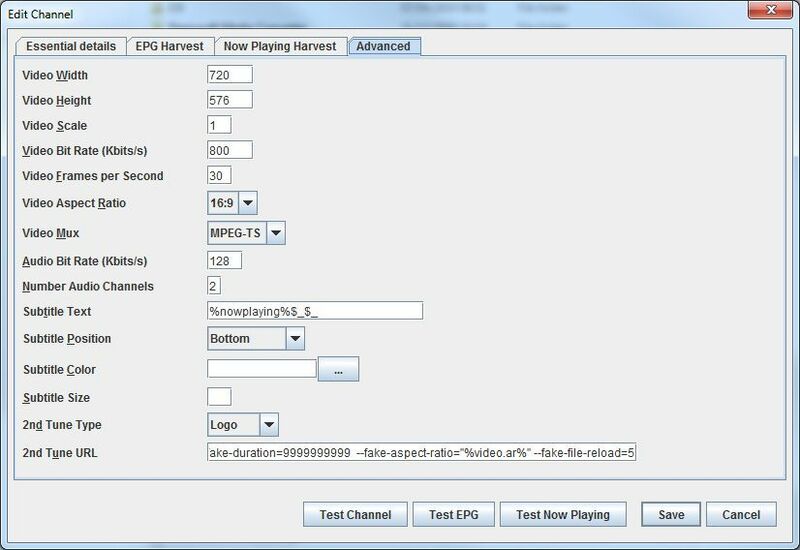 Test the channels and EPG harvest. Manage your SageTV channel lineup and online services. Installation of the encoder requires installation of a single plugin jar file to your SageTV installation and updates to the Sage.properties file. A comprehensive install wizard performs the whole installation task and provides options to downgrade to your previous version and uninstall. Support for MPEG2 IP TV. Support for Audio only devices. New feature to ensure VLC sessions die. The VLC media player. Use the latest version. Version 6.4 of SageTV or later. Version 6.6 and the latest STV update if you wish to use online services. Also works with version 7. Unzip the download file in a location of your choice. The zip file contains a user guide and a jar file. On windows vista and windows 7 you should run this in an elevated command prompt or from your admistrator account. Support is available on this thread. Many thanks to all those who have given WebFeedEncoder a try and provided valuable feedback. Special thanks to everybody who helped with pre-release testing. Accommodate the latest VLC release 1.0.5 removing the need to run the old 0.9.8 release. New channel type: TV (silent) and tuning commands to cater for IP cameras. New channel type: Device (audio), tuning commands and seed plugin to cater for audio input devices. New channel type: TV (MPEG) and tuning commands to cater for IP TV channels that require no transcoding to MPEG2. New radio tune/detune commands to allow use of later versions of VLC where input slave does not work. 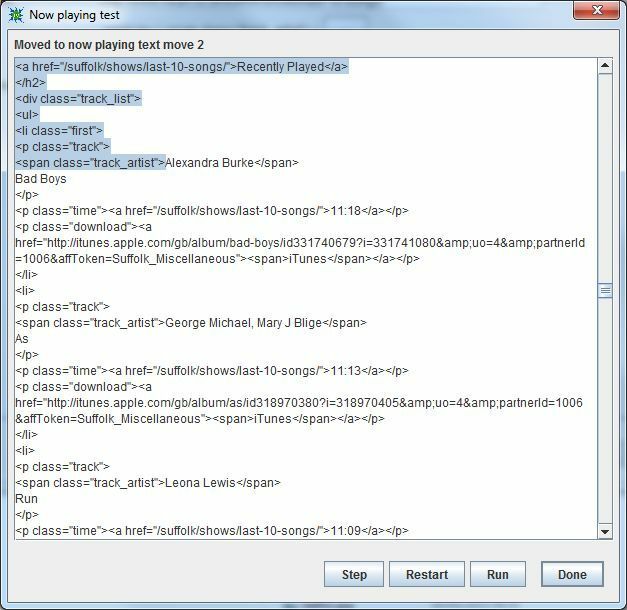 To accommodate the above a tuning URL is expanded at encoder startup so that it is refers to a playlist then the playlist is converted to a list of streams. This is to get around a VLC bug where this is not done automatically. Add feature where detuning automatically kills any spawned (VLC or other) processes that refuse to stop when asked. 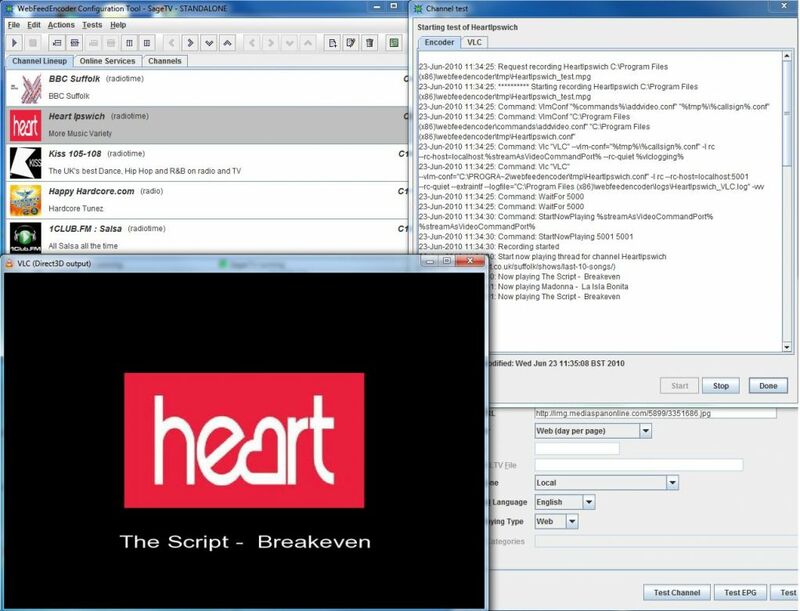 New grabber type: XMLTV file to allow EPG data to be sourced from an XMLTV file. Added “lineupIsExternallyManaged” property which if set true allows the old style use of a separate XMLTV importer tool and disables the updating of SageTV EPG and lineup from the config tool and encoder. An XMLTV file is output instead. The configtool arguments used to run remotely now must be prefixed with -host=, -port= and -sagePort=. A help message is output if incorrect arguments are used. The configtool now accepts a -console argument which forces logging output to be output to the screen as well as to a file. The configtool now correctly saves new user defined day URL suffix formats creating while specifying an EPG harvest and offers it as a choice for new channels. The configtool now longer loads the channels twice. The configtool now no longer blocks user actions while waiting for a timeout in circumstances where SageTV or the encoder are not available. The configtool chanel dialog now has three seperate buttons for testing the channel, EPG and now playing. The configtool now allows all types of EPG grab to be tested rather than just web based ones. The configtool EPG grab test run will now perform programme merging like the actual EPG test run does where programmes that cross day boundaries are joined and stop times are added if they are not present in the source web page. The configtool grabber test dialog now shows start and stop days separately from start and stop times. The configtool channel dialog now sorts many combo box lists for ease of locating required values. The configtool channel dialog will now correctly set the id to be the same as the callsign for channel types with no seed plugin. The configtool channel dialog now correctly saves the timezone no matter what the grabber type. The configtool channel dialog now defaults the channel timezone to “Local” rather than the actual local timezone to allow portability of radiotime sample channel properties. The configtool channel dialog now correctly defaults Grabber type to the default day long programme. The configtool now allows actions on a channel can now be launched when a channel is selected in any tab. The configtool now allows a single channel to be selected and reloaded from file. The configtool now allows the user to view any seed channel properties and refresh them from the source web site. The configtool now allows the channels tests to be launched from anywhere. The configtool channel dialog now allows editing of the output video and audio stream parameters in an “Advanced” tab. The configtool now displays an “about” box with version information. The configtool now allows channel testing in standalone mode. New channel types property: “type.name” which provides a user friendly name for the channel type. Removed channel properties: nowplaying.command.text, nowplaying.command.position, nowplaying.command.color, nowplaying.command.size, nowplaying.prefix, nowplaying.suffix channel properties. New channel properties: subtitle.text, subtitle.name, subtitle.pos, subtitle.color, subtitle.size channel properties..
New channel property: subtitle text allows reference to other channel properties within it. New channel property to specify an XMLTV file to source EPG data has been added. New channel property to specify a supplementary URL that will provide missing audio or video from the primary tuning URL. New channel property to specify the type of supplementary URL. Channel properties are now saved with unicode characters escaped to cater for channels of non-Latin origin. Channel properties are now saved with improved processing of comments. The grabber can now be run standalone to produce an XMLTV file. The grabber will automatically create a “guide” directory will be created to contain EPG guide output as XMLTV if not already present. The grabber now sets the timezone for XMLTV start and stop times as UTC. The grabber now correctly formats of the start and stop times to include the timezone. The grabber now correctly processes timezones of grabbed programmes. The encoder will now longer log worrying “SageTV has possibly died” log messages. The encoder will accept a new tuning command: “Vlc” to be used instead of Exec cmd /c “VLC” “%vlc%”. The encoder will accept a new tuning command: “ExecAndWait” where the requirement is to launch an OS command but wait for it to finish. The encoder will accept a new tuning command: “VlmConf” which allows a VLC VLM conf file to be created from a template substituting channel properties. The encoder will now replace a reference to “%commands%” in a tuning command with the file path of the commands directory. The installer now saves upgraded config files in the same format as the config tool. The installer now processes custom properties added by user in an old installation correctly. The installer now recommends the latest version of VLC be installed. 0.9.5 - 6th release (Beta). Added management of extra services and their categories on SageTV online services menu. 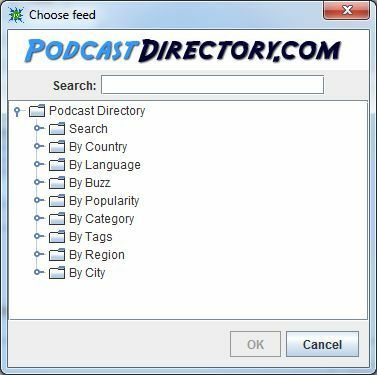 Added a seed plugin for www.podcastdirectory.com to seed online services. Made seed plugins data driven so more can be easily added and existing ones maintained. Fixed issues with VLC processes not been killed on webfeedencoder shutdown. Exceptions thrown on configtool/encoder start up are handled rather than causing silent death. Bad channels found during configtool/encoder startup are skipped rather than causing silent death. The EPG plugin no longer shares the same management port as the encoder. This caused the encoder or SageTV to appear down after either had been restarted. The configtool and encoder will correctly reconnect to SageTV after it is restarted. The configtool channel test log file names have been improved. The configtool device seed plugin now uses the correct device name in the tuning URL. The configtool now disables the webfeedencoder EPG plugin when remove lineup is selected to allow configuration of video sources with native EPG. The configtool occasional failures in start and stop of webfeedencoder now fixed. The configtool output from starting/stopping services is now recorded in the log file. The configtool EPG grab test 'Run' button now works. The configtool channel addition now defaults timezone to local time rather than GMT. The configtool will now show the correct channel icon after addition of or editing of a channel. The configtool will periodically check for presence of SageTV and the encoder. The configtool now has a menu option to reload the channel database from disk. The configtool on moving channels up and down the lineup will also move the channel selection so a continued move further up or down the lineup is possible with reselection. The configtool will no longer allow deletion of a channel without it first being removed from the lineup. The configtool will now terminate any channel test when the channel test dialog is dismissed. The configtool now disallows edits rather than crashing if in remote mode and webfeedencoder not running. The configtool can now start up webfeedencoder via SageTV in remote mode. The configtool now indicates in the title bar if it is remote mode. The configtool will now create a logs directory if one is not present and will not require presence of DLLs when working in remote mode. The configtool the seed selection dialog now allows the external web site to be searched for feeds. 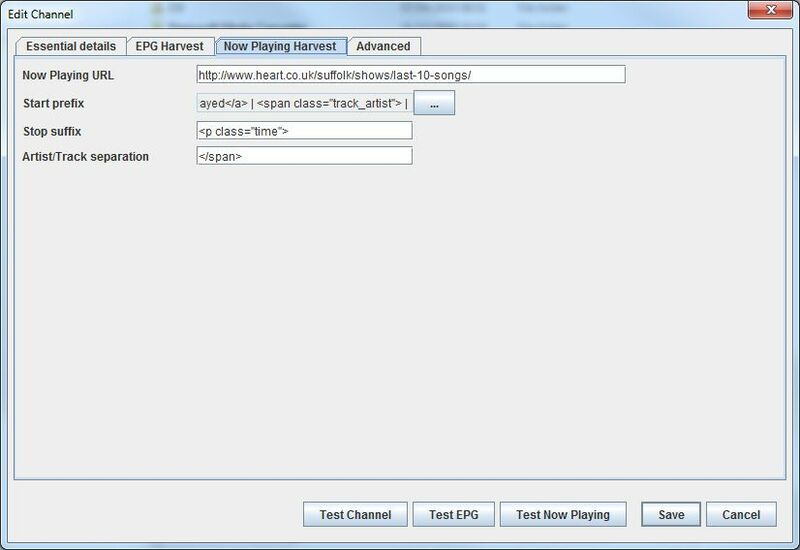 The configtool issue where EPG harvest test cached and incorrectly used downloaded content for both first day and weekly EPG harvests has been fixed. The configtool issue where sending the lineup twice had the effect of removing knowledge of any existing EPG plugin has been fixed. The configtool seed selection dialog branch children are now alphabetically sorted. The configtool channel test now shows the video in a VLC window. The configtool TV channel test now shows the VLC test log in “Stream to mpeg” rather than “Save as mp3” tab. The encoder now tidies any channel test files on exit. EPG grab will now push times to SageTV in GMT rather than local time. EPG grab will now make program times have zero seconds if seconds. 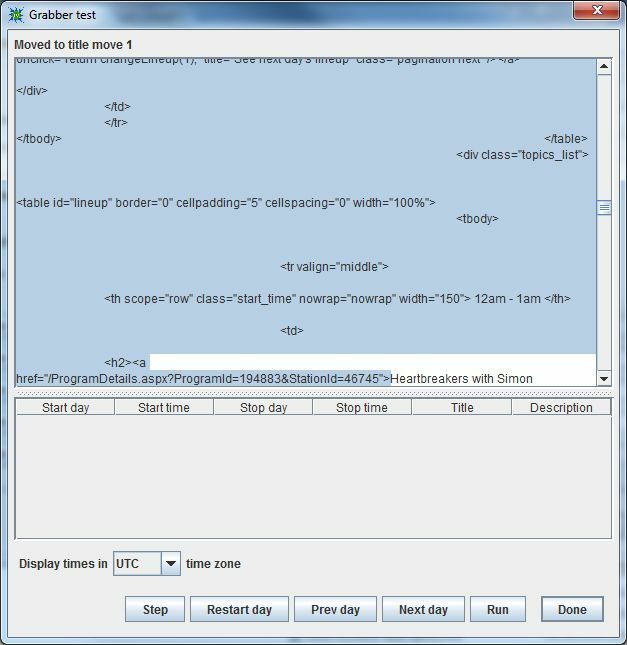 EPG grab now assigns correct day to a days EPG within generic grabber. Tune command files have been updated to be compliant with VLC 1.0.0 onward transcoding parameters - radio still does not work with these versions. Windows detune commands now contain file paths in quotes to deal with files with spaces. Sample station Kiss105108 grabber type has changed to use day-long programme for EPG. Updated user guide to advise Vista/Win7 users to run installer with elevated command prompt. The installer now tidies up EPG plugin log files on deinstall. The installer will no longer try to delete files that are not there. 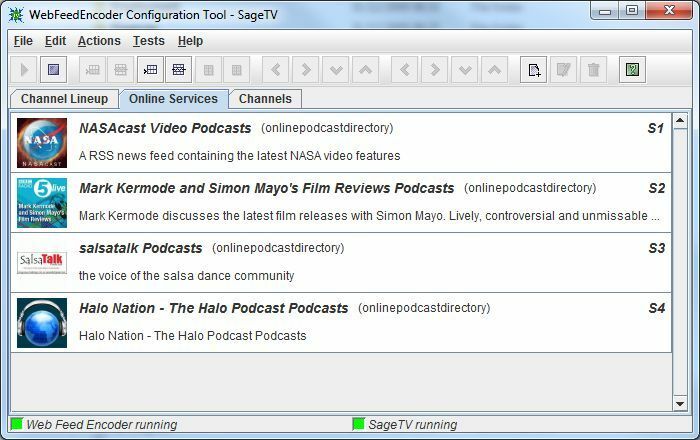 The installer will disable use of the EPG plugin on video sources where native SageTV EPG is users by the installer when configuring SageTV whereever native SageTV EPG sources are used. The installer now takes a backup of Sage.properties as insurance. The installer now has a "Repair" which refreshes non-config delivered components. The installer now copes with file paths with spaces when setting file permissions. The installation jar file can be run from a directory with spaces in. The installer will check the version of Java being used to run it and report and error if its too old. The installer will now catch and display any errors found in initialization. The installer will not repeat configuration of the epg_import_plugin sage property once configured as this leads to infinite loop in SageTV. The installer fixed so that windows file separators are not doubled in the encoder.props file. The installer now removes extra backslashes that appear in windows pathnames when configuring webfeedencoder but take account of UNC pathnames. The installer no longer prints out exception messages when operating system tasks complete. The installer will correctly default installation directory and SageTV directory. The installer now contains a better test of whether webfeedencoder is still in use prior to upgrade as uninstall and upgrade would fail. The installer will now restore SageTV configuration for an earlier version in two phases separated by restoration of the previous webfeedencoder directory. The installer now provides manual instructions and information prior to uninstall, restore and repair. The installer now provides helpful next step instructions after install or upgrade. The installer will now choose unique characters to choose buttons in headless mode. The installer will allow key configuration parameters to be reviewed and edited in subsequent runs. The installer no longer requires '\\' to be used as directory separators in paths. The installer in headless mode no longer goes into an infinite loop of 'Does not exist' if the destination directory for the installation does now exist. The installer now recommends the version of VLC to install and provides a URL that can be cut and paste. The installer no longer overwrites encoder details added for other plugins e.g. slimplayer. 0.9.4 - 5th release (Beta). Direct injection of EPG data and lineup to SageTV eliminating the need to go via XMLTV and XMLTV importers. Installation wizard which performs all installation, deinstallation, upgrade, downgrade and setup tasks. 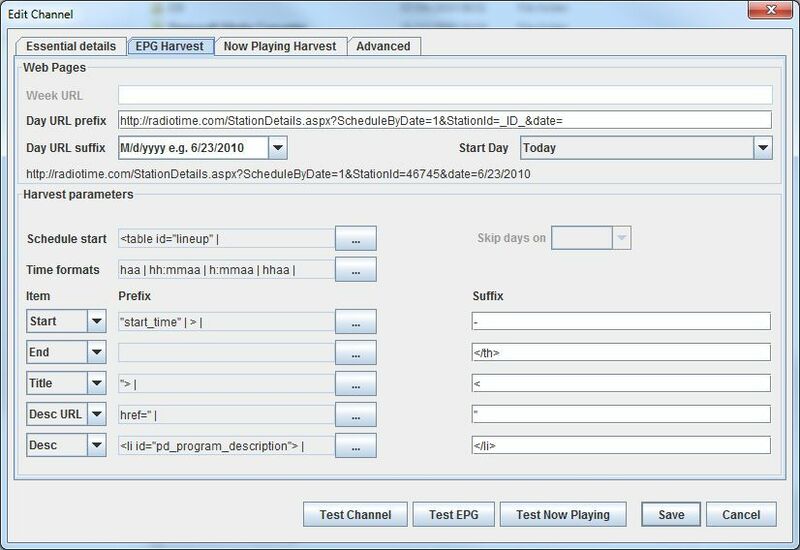 A configuration tool eliminating the need for manual configuration of lineup which allows direct injection of lineup and EPG to SageTV and provides test tools for channels and web harvests. Inclusion of direct show devices as a type of channel. Substantial cleanup of config files and some renaming of properties to be more consistent. Introduced the concept of a seed plugin - which knows how to browse the channel listings of external websites and grab initial channel config from them. This "seed" channel config can then be further overridden to add missing information or correct web site mistakes. Existing code for direct show devices and radiotime stations recast as seed plugins. 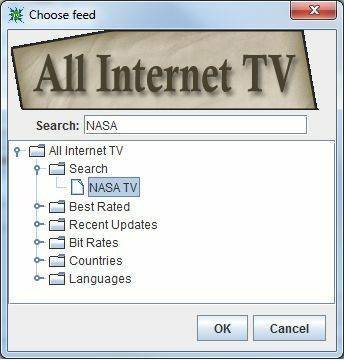 A new seed plugin for www.allinternettv.com added so internet TV channels can be configured. 0.9.3 - 4th release (Beta). Ability to tune to internet TV channels. Support for unix specific tuning commands - not fully tested yet - beta tester required. To support the above sagetv.dir and vlc.dir become sagetv.logos.dir and vlc.exe to point to the required resource. Made tuning and detuning script driven per channel to allow custom tuning instructions. The generic grabber now allows stop times. This fixes problems where stations do not broadcast 24 hour. The web-based now playing text processing now allows incremental advance to the beginning of track now playing data in the source html. If web-based now playing text is not specified the encoder will look for ICY meta data or ID3v2 tags to get the track now playing. Fixed paths for config and log files in unix. Provide a substitute image for the video if no channel logo is available. 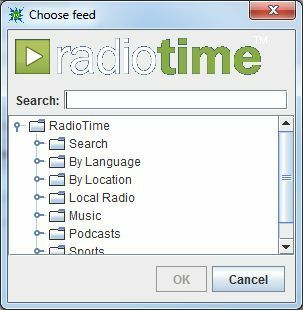 Fix the issue where sometimes the logo image file name on www.radiotime.com was prefixed with the wrong channel id. Fix sample WMNF channel properties where the EPG was configired to be a day behind. 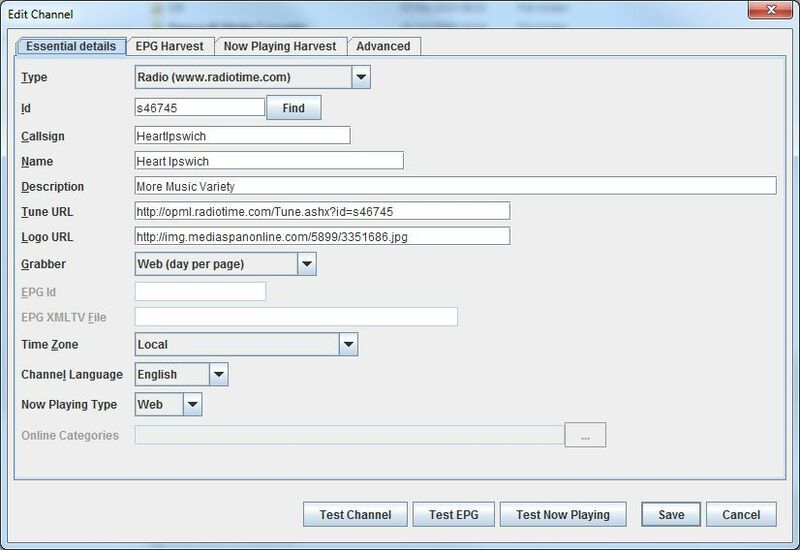 Fix issue where radiotime day epg urls where being created only for the first seven days of after the channel first appears. Set the now playing text size before presenting it rather than after. 0.9.2 - 3rd release (Beta). Fixed bug where images did not get downloaded when a channel offset is in force. Fixed bug where an empty channel properties file is always created when an unknown id is used in the channel lineup. Changed sample channels callsigns to be in agreement with radio and hence also renamed them. Added some debug and a possible fix to the properties file not found message in linux. 0.9.1 - 2nd release (Beta). Integrated the webepggrabber release with webfeedencoder. While still useful separately I no longer which to manage it in a seperate distribution. Correct port number in the instructions. Fix various problems caching the channel logo and temporary video image. If you delete either they are now correctly reproduced. The channel id can now be a RadioTime station id. If this is used no other channel configuration is necessary. A separate cache directory now holds cached images and radio time properties files. The tmp directory now holds disposable files. Improved the housekeeping of temporary files. Improved the recording state machine to cope with odd behaviours resulting from the time it takes to tune. Added a shutdown hook to stop recording if the process is shutdown. Added a service wrapper so the encoder can be run as a windows service. Remove HTML escape codes from titles, descriptions and now playing text. Now playing html parsing now recognises that there may be a seperator between artist and title to be removed. Fixed a bug in the default grabber which caused programmes to still be of 24 hour length when Daylight Savings occurred. A channel timezone can now be specified for the generic grabber so programme times are correctly calculated for foreign stations can converted to UTC in the XMLTV. The generic grabber can now handle the programme description being accessed via another URL. The generic grabber now allows multiple time formats for schedule pages that mix and match time style e.g. 3pm-5.30pm. The generic grabber can now handle a different order of items in the schedule. Sometimes they can appear time, title, desc and sometimes its a different order. Add a category "Radio" to the radio programmes.